Christmas is fast approaching; to celebrate we're sharing this summertime recipe created by Australian Eggs that's sure to bring the festive fun to the brunch table this season. 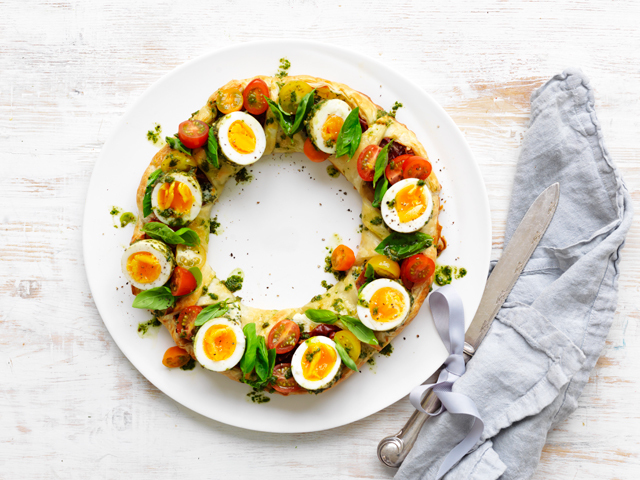 The colourful herbed ricotta pastry wreath with pesto eggs is a fresh and festive way to feed a group of friends or family and is packed full of protein, fibre, antioxidants and vitamins – perfect for breakfast, brunch or lunch. Preheat oven to 200°C fan forced. Lay baking paper to form a large square on your benchtop. Then lay out the pastry sheets, overlapping them by 2cm to form a 46cm square. Press the edges of the pastry to join. Using a large upside-down bowl as a guide, cut out a 30cm circle from the pastry. Place pastry circle on a baking tray lined with baking paper. Score a 13cm circle in the centre of the pastry round, making sure not to cut all the way through the pastry. Starting at the centre of the 13cm circle, using a small knife, cut only the 13cm circle into 8 triangles (these will still be attached to the larger pastry circle). Mix together the ricotta, parsley, basil, parmesan, salt and pepper. Spread the ricotta mixture on the pastry ring, leaving a 2cm border from the outer edge. Arrange the prosciutto on top of the ricotta. Fold over the 2cm border pressing the pastry into the ricotta mixture. Fold the 8 triangle wedges over the pastry, pressing to seal on the outside edge of the wreath. Brush the pastry with beaten egg. Bake for 30 minutes, or until golden brown and pasty is puffed. Carefully roll the eggs in pesto, halve and place onto the wreath. Scatter with tomatoes and drizzle with remaining pesto. Scatter with extra basil leaves and serve. For a vegetarian version, omit the prosciutto. You can make this tart a day ahead and keep it refrigerated. To serve top with tomatoes, eggs, pesto and basil. For a cheat's version, use 2 tablespoons pesto in the ricotta instead of herbs.